Esther Landin from the North Orange County Regional Consortium for Adult Education gave an overview of the Corrections to College Initiative followed by Santiago Canyon College and Cal State Fullerton's Project Rebound programs presenting on the resources and services that they offer here in Orange County. 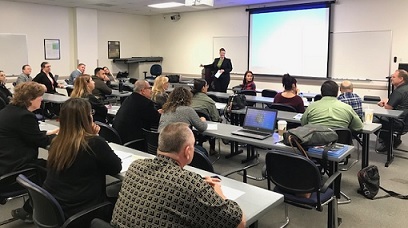 The South Coast Parole District and Orange County Re-Entry Partnership (OCREP), agents discussed what it means to be a former Long Time Offender - what resources, obstacles and challenges they face. We also had 2 former lifer's speak to us about their journeys and where they are at now. Juana Larios from the OC Probation Office presented about the county procurement process including tips and common mistakes on applications. 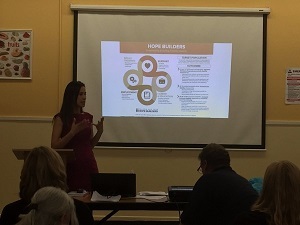 Jenny Hudson and Janel Alberts of OCHCA shared updates and current stats with the Prop 47 funding and projects. 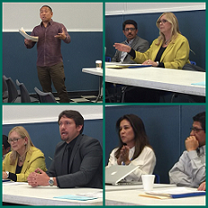 They will relay more information as needed through OCREP and the Prop 47 Advisory Committee. Carole Urie of Returning Home Foundation presented the reentry resource guide that she created with members and how it is currently being used in the jails. 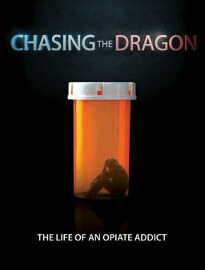 OCREP and the City of Anaheim Mayor Tait's Drug Free Anaheim partnered for a free screening of the FBI's documentary "Chasing the Dragon" followed by a discussion regarding the Opioid epidemic here in Orange County at the City National Grove of Anaheim. 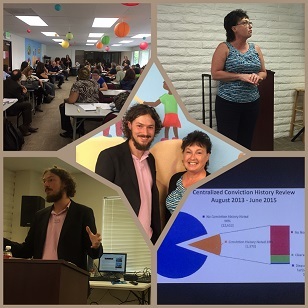 Brought to you by Parole Agency Representative Latisha Fairley, OCREP hosted a special general member meeting featuring Parole's Supervisory Agents. Topics included what is parole, what services/resources do they provide and how can community organizations better work with them for mutual clients. Gaps and challenges in services were discussed. Common themes were that Parole is in the business of motivating clients to succeed and are enthused to better collaborate with CBO's. Have a question/concern or want to connect with Parole? Contact Latisha via our Advisory Committee page. Employment Committee Co-Chairs Stephanie Hammerwold (Pacific Reentry Career Services) and Ashley Baribeault-Vlcan (Working Wardrobes) presented on Fair Chance Hiring, Knowing Your Rights, Forming Relationships with Employers and WOTC Tax Credits/Incentives. Attendees engaged in a discussion on best practices and were able to share their methods of engaging employers/clients with one another. We look forward to follow up events regarding this important topic. Meeting was hosted at Working Wardrobes in Irvine. 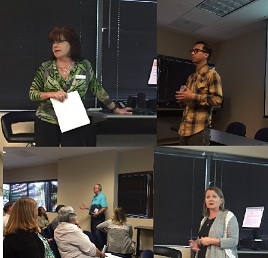 Speakers Miguel Hernandez from OCCCO Pico, Carole Urie from Returning Home Foundation, Justin Cerrillo from the Orange County Public Defender Office and Suzanne Campbell from Project Kinship shared updates on current policies as well as how to get involved civically in your community. Hosted at partner agency Phoenix House in Santa Ana. Each year, there are an estimated 2 million people with serious mental illnesses admitted to jails across the nation. Thats equivalent to the populations of Vermont and New Hampshirecombined. Almost three-quarters of these adults also have drug and alcohol use problems. Once incarcerated, individuals with mental illnesses tend to stay longer in jail and upon release are at a higher risk of returning to incarceration than those without these illnesses. The human toll of this problemand its cost to taxpayersis staggering. 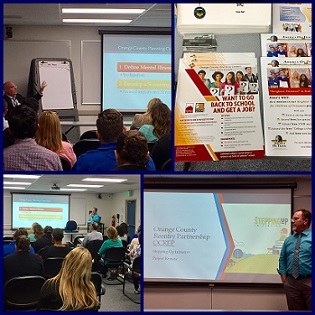 OCREP Agency Representatives Geoff Henderson (OCSD) and Erik Wadsworth (OCPD) presented on what the overall initiative is and then what Orange County is currently doing for this project. Hosted at the Probation Department GAO Office. Many incarcerated individuals in Orange County may be affected by an intellectual disability. According to the National Institute on Health (NIH), intellectual disability refers to a group of disorders characterized by a limited mental capacity and difficulty with adaptive behaviors such as managing money, schedules and routines, or social interactions. Intellectual disability originates before the age of 18 and may result from physical causes, such as autism or cerebral palsy or from nonphysical causes, such as lack of stimulation and adult responsiveness. Presenters included: Angela Guevara, Assistant Professor, Santiago Canyon College; Joe Dorchak, Counselor, Department of Rehabilitation; Jacqui Knudsen, Community Outreach Coordinator & Family Support, Regional Center of OC; Marsalee Malatesta LCSW, Program Director, Community Based Adult Services; Robert Morrill MSW, Rehabilitation Institute of Southern California and Linda Seppla, Associate Director, Integrated Resources Institute provided guidelines of assistance, services, and accommodations available in Orange County for individuals who may be affected by an intellectual disability. 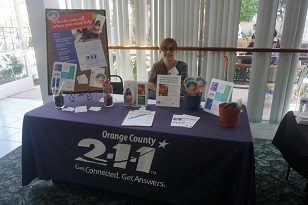 Thank you to the Orange County One Stop Center in Irvine for hosting our event! Featured Speakers were Dean Bramlett, HR Manager from Crown ACE Hardware and Maria "Alex" Alexander, Executive Director from Center for Living and Learning. Moderator was Stephanie Hammerwold from Pacific Reentry Services. 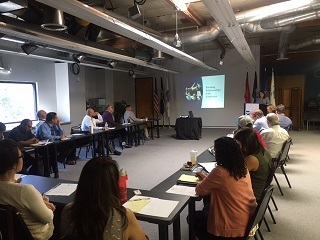 Presentation topics included: best practices in using criminal background checks in the hiring process, first person success stories of hiring the formally incarcerated, best practices in offering a position to a formally incarcerated individual, and more! Hosted at Working Wardrobes in Irvine. 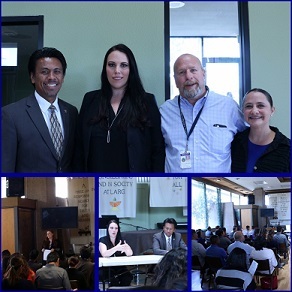 Speakers included Brendan Kavanaugh and Kristen Bonfiglio from Phoenix House and Karyn Mendoza representing the OC Mental Health Board who discussed substance abuse, informed trauma and mental health issues/concerns in Orange County. Phoenix House offered facility tours prior to the meeting. Dana Schultz, Probation Administrative & Fiscal Division Director and Bryan Prieto, Chief Deputy Probation Officer shared information on the newly re-released Recidivism Reduction Grant including challenges, new updates, who should apply and more as well as county processes for filing RFP's, Prop 47 updates and more. 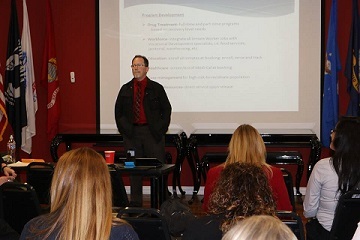 Topics Covered: Re-entry Train the Trainer: helping clients navigate systems. Geoff shared information on the TJC (Transition from Jails to Community) model. Describing the program from inception to current state as well as evidence based model community corrections. OCREP also recognized Sheriff's employees Jeffrie Anne Smith and Henry Mai for their many years of dedication and service to OCREP. 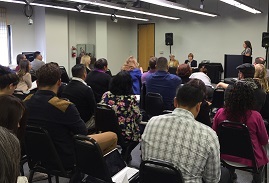 Update on reentry housing in Orange County including common language, misconceptions, available resources an short comings followed by a group discussion on challenges and ideas surrounding the topic. 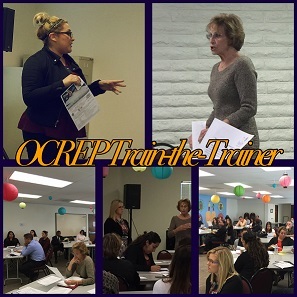 OCREP and BI Inc in partnership with CCCOE/CDCR Parolee Education Program hosted OCs first Reentry Resource Fair. A one-stop community resource fair for the formerly incarcerated and their families featuring over 50 local service providers. Prop 47 panel discussion featuring Orange County Probation Department Division Director Keith Gotts; Orange County Sheriff's Department Assistant Sheriff Steve Kea and Law Offices of Brian Gurwitz, Criminal Defense Attorney Brian Gurwitz. Discussed local and community ramifications, expectations and concerns regarding the passing of proposition 47.